The Marc by Marc Jacobs Natasha Petal to the Metal Handbag is available for the new season in a range of pastel and bright colours. 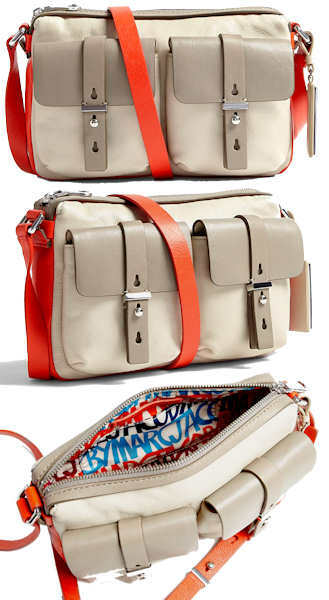 This bag is a classic style from Marc by Marc Jacobs, which is reintroduced each season in different colours. The bag is a cross body bag which has a flap over with a hidden magnetic clasp. There is a zip fastening pouch within the flap over. On the front of the bag, there are two gold coloured bird plaques with straps which thread through the centre of them. All the metal hardware on the bag is gold in colour. There are two external, virtually vertical, zip pockets on the front of the bag which have branded Marc by Marc Jacobs zip pulls. The bag has a removable and adjustable cross body strap with a buckle fastening at the base of the handles. On the back of the bag there is also buckle belted detail. Inside, the bag is fully lined in black and white logo fabric and there is one zip pocket and two slip pockets. Measurements: 24cm / 9.4″ x 34cm / 13.4″ x 10cm / 3.9″; all measurements are approximate. Both the above companies are UK based, but offer worldwide delivery. The D&G Redmire Bag is a spacious leather tote bag. It has a zip top fastening and a single main compartment, with an additional large front pocket that has a push lock fastening, which can actually be locked using the key contained in the leather hang tag. The bag has gold tone metal hardware throughout, and features two rolled leather top handles and a separate fully adjustable and removable cross body strap. Inside, the bag is fully lined in canvas and there is a leather trimmed zip pocket. Measurements: 25cm / 9.8″ x 30cm / 11.7″ x 20cm / 7.8″ ; all measurements are approximate. The Redmire is one of the final D&G bags (this collection is the final D&G collection ever) and it is a beautiful yet practical tote bag. It is spacious enough for daily use, yet posh enough to add a luxe touch to any day wear outfit. It is suited to both on and off duty use. 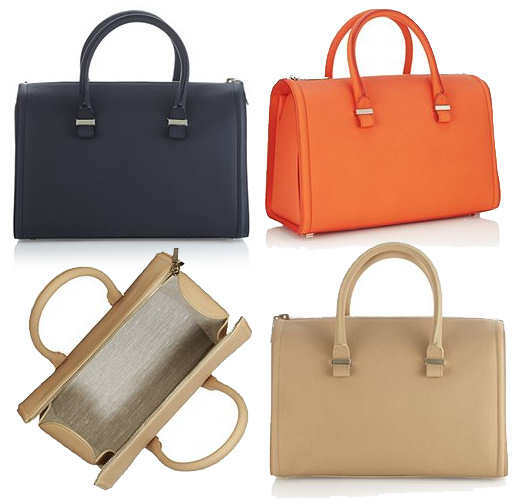 The Victoria Beckham Victoria Tote is a rectangular boxy bag, available in three colour ways, with two leather top handles. 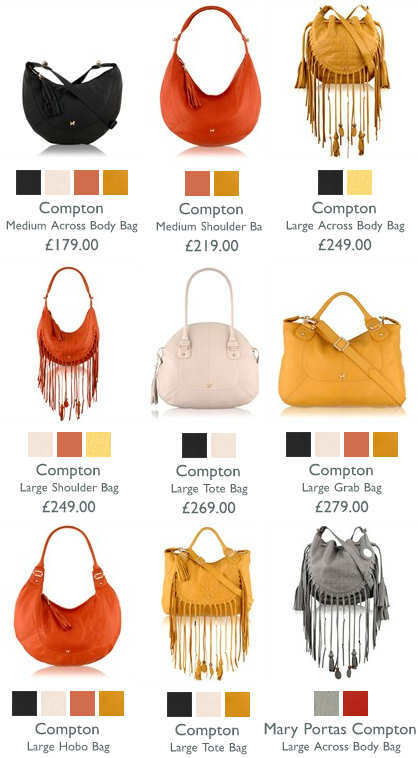 The bag is made from pure buffalo leather and it has pale gold coloured hardware throughout. The tote has a top zip fastening; inside, it is fully lined in beige coloured canvas twill. There are two slip pockets inside the bag. It is delivered with a Victoria Beckham dust bag. 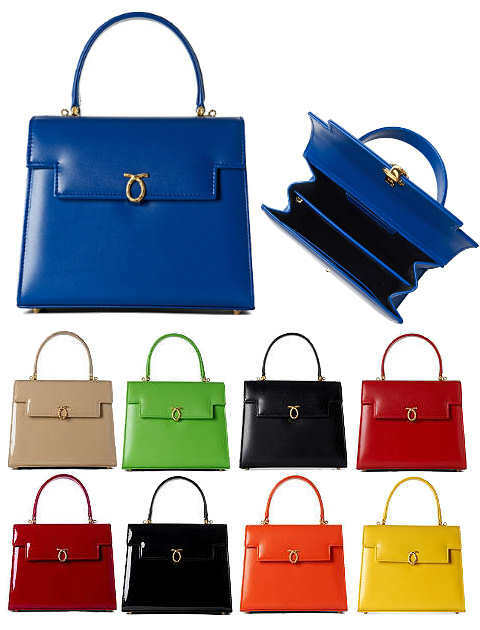 Style note: This is a sleek and covetable bag which can either be carried in your hands or in the crook of your elbow. It is sleek, covetable, and a fantastic daily use handbag for the most particular of fashionistas. The Victoria Beckham Shopping Bag is a roomy shopper made from buttersoft calfskin leather. It is available in three colourways – orange, tan with a contrasting grezzo lino or navy with a contrasting grezzo lino. The shopper has two structured top handles and features gold coloured metal hardware throughout. The bag has a single spacious main compartment, with a large zip pocket and a slip pocket. The interior is fully lined in beige twill. The bag is delivered with a Victoria Beckham dust bag. Style note: This is a lovely handbag for daily use. It’s spacious and roomy, certainly large enough for some girly shopping whilst at the same time adding glamour to your day wear outfit. The Victoria Beckham Victoria Bag is an orange tote bag, made from pure buffalo leather. It features two structured top handles and is a structured, square shape. The bag has a top luggage lock fastening. Inside, there is one zip pocket and three slip pockets. The bag is fully lined and there are studs on the base for protection. Style note: The Victoria Bag is the bag of a lifetime. Highly luxurious, the finish of this bag is gorgeous, as are all the bags in this range. The Victoria Bag is boxy and spacious – it would make a fabulous workbag for the successful executive or entrepreneur, as it definitely says “I’ve arrived”. It’s also a chic bag to carry for any important occasion as it really does have head turning style. The Marc by Marc Jacobs Camera Bag is made from three different tones of stone leather, with a bright orange cross body strap. The bag has silver coloured metal hardware throughout, a zip top fastening and bright orange panels, which match the cross bodey strap, to the sides. There are two flap pockets on the front of the bag with faux buckle fastenings which actually have a concealed magnetic closure. The bag is also embellished with a metal and leather luggage tag. Inside, it is lined in signature multi coloured satin and there are three slip pockets. Measurements: 25cm / 9.8″ x 17cm / 11.8″ x 11cm /4.5″. All measurements are approximate. Style note: Stylish and achingly cool, the new Marc by Marc Jacobs Camera Bag is a perfect marriage between neutrals and neons ticking the boxes for both seasonal trends. This bag is great for shopping and travel, adding a preppy touch to any casual outfit. The bags are all made from textured leather, and the fringed bags also have mock reptile / crocodile embossing to the leather. There is a small metal gold, rose gold or pewter Radley dog on the front of each bag, with the exception of the Mary Portas bag which has instead a mirror set in leather which hangs from the handle, the leather being embossed with the words Mary Portas & Radley. All the none fringed bags have a top zip fastening and a tassel zip pull, which can be removed with the gold tone lobster clasp fitting. All the fringed bags have fringing which is embellished with decorations including gold coloured bars, wood beads and leather flowers. All of the bags are lined in the Radley Scottie dog print jacquard fabric, with the exception of the Mary Portas Compton bag which is lined in a “Radley London” jacquard print. This is a multiway bag with two top handles and a removable, adjustable cross body strap. Inside, there is one zipped pocket and two slip pockets. Measurements: 38cm x 22cm x 12cm; the length of the strap from the top of the bag to the apex is 52cm. This is a scoop shape hobo style bag with gold or pewter hardware embellishments. It has a sleek and sophisticated silhouette. There is one zip pocket and two slip pockets inside. Measurements: 37cm x 20cm x 15cm; the length of the strap from the top of the bag to the apex is 31cm. This bag has a zip top fastening and a slouchy, relaxed scoop shape. It has one zip pocket and two slip pockets inside. Measurements: 38cm x 32cm x 14cm; the length of the strap from the top of the bag to the apex is 20cm. This is a scoop shape bag with a clean silhouette. It has one zip and one slip pocket inside. Measurements: 32cm x 24cm x 5cm; the length of the handles from the top of the bag to the apex is 68cm. 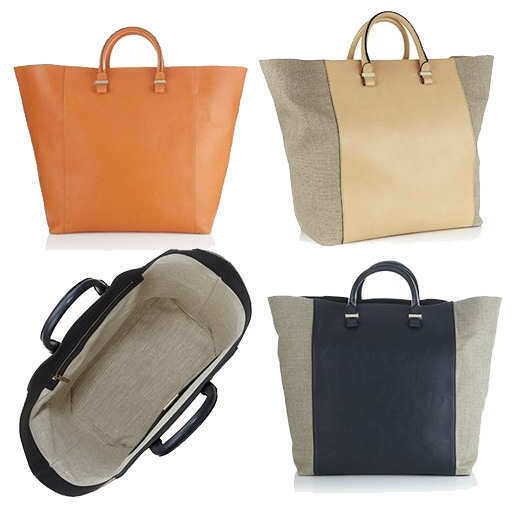 This is a structured, dome shaped tote that is ideal for daily use. It has a zip pocket and two slip pockets inside. Measurements: 38cm x 32cm x 14cm; the length of the straps from the top of the bag to the apex is 20cm. This is a scoop shape bag with clean lines that will never date. I rather like the electric blue colour, which is a little different and will work wonderfully well with denim. It has one zip fastening and two slip pockets. Measurements: 47cm x 33cm x 15cm; the length of the straps from the top of the bag to the apex is 30cm. 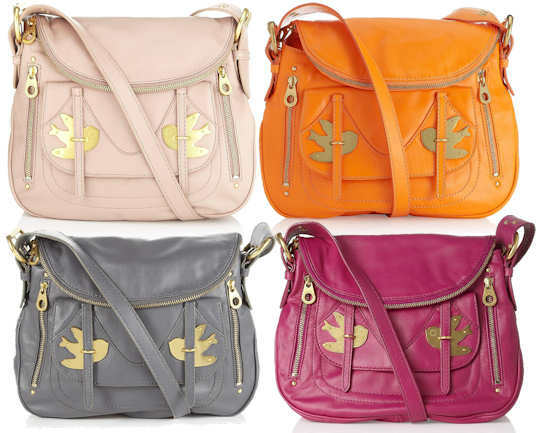 This is a multiway bag with two top handles and a removable, adjustable cross body strap. Inside, there is one zip fastening pocket and two slip pockets. Measurements: 35cm x 27cm x 6cm; the length of the strap from the top of the bag to the apex is 52cm. This bag has a drawstring top and a scoop shape. It’s nice and relaxed, with a slouchy feel to it. Inside, there is a zip pocket and a slip pocket. Measurements: 47cm x 33cm x 15cm; the length of the strap from the top of the bag to the apex is 58cm. You can use coupon codes on this bag. The Tory Burch Robinson Double Tote Bag is a leather tote bag with two top handles and a separate, detachable, shoulder / cross body strap. Made from high quality Italian leather, the bag has gold tone metal hardware throughout including the signature logo on the front of the bag. The bag has a spacious main compartment, with two zip fastening compartments, one on either side. 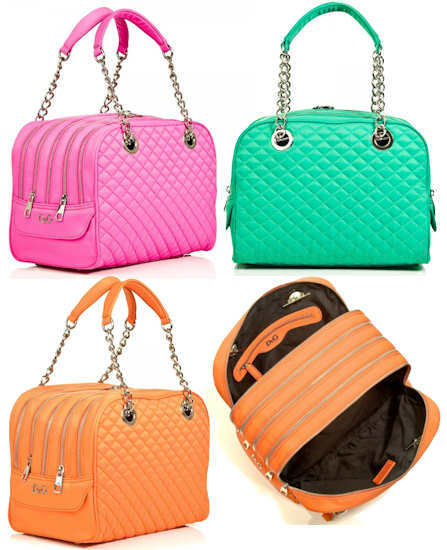 The bag is lined in a gorgeous contrast fabric – blue for the black bag and pink for the orange bag. The main compartment has a magnetic stud fastening, and inside there is the Tory Burch logo, a zip pocket, a mobile phone pocket, a further slip pocket and a leather framed handbag mirror which attaches to the zip pull on the interior pocket. The bag also features popper fastenings either side, so it can be expanded in size if needed. Measurements: 14″ / 36cm x 5.5″ /14cm x 10.75″ /27cm; 24″ /61cm cross body strap; top handles have a 4″ /10cm drop; all measurements are approximate. 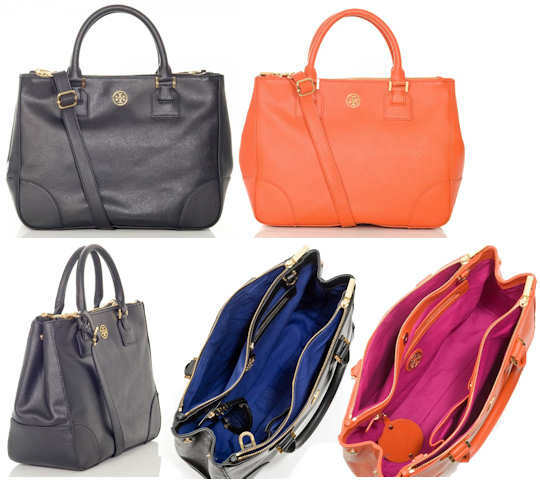 Style note: The Robinson Tote is named after Tory Burch’s parents whose surname is Robinson. It is a perfectly organised, beautiful quality bag, ideal for daily use by the well heeled girl. You can go for classic black, or embrace the current season trend for candy bright colours by choosing the orange. Whichever you choose, there are enough pockets and compartments to keep even the most organised fashionista happy. With the multiple carry options, I can’t think of a reason not to covet this awesomely designed handbag. The D&G Swaledale bag is a SS2012 season bag which is available in three bright, virtually neon colours – pink, green and orange. With five separate zip fastening compartments and a further zip fastening pocket inside, this is a bag where there’s a place for everything. The bag has two chunky chain shoulder straps which thread through oversized eyelets on the bag and have shoulder rest detail, and the D&G logo appears on the side of the bag. All the metal hardware on the bags is silver in colour. Style note: The D&G Swaledale looks like a quilted nylon version of the Lily Glam bag and embraces the new season trend for bright and neon colours. It’s the perfect companiment to any summer outfit and adds a definitive splash of colour to neutral outfits. Being light weight, its also a great bag for travelling with. You’ll just need to remember which compartment you put your passport and tickets in.